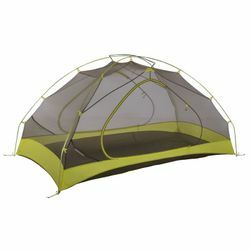 Marmot Tungsten UL Hatchback 2P Tent. The lightweight Tungsten Ultralight Hatchback 2-Person Tent offers the space, comfort, and lightweight performance necessary for epic up-mountain treks when you want to relax after a tough segment or multiday treks that include single track rides. This 2-person tent has a pole in the back that increases stability while the removable front door adds versatility. This ultralight tent has an incredibly roomy sleeping area and tons of headroom, thanks to zone pre-bend construction that creates vertical walls. The rain-shield polyester flysheet won't stretch and sag when wet, ensuring you're comfortable and dry on the inside while camping or backpacking. Two D-shaped doors with large vestibules provide plenty of space to store everyone's gear when the rain is coming down.